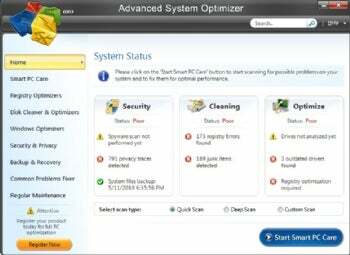 Advanced System Optimizer ($40, free feature-limited demo) is an all-in-one tool that promises to keep your PC running in top shape, keep it secure, and clean your hard disk. It does a very deep and comprehensive job of finding a wide range of issues. Bear in mind, though, that this downloadable demo will not fix the problems that it finds. For example, it won't clean junk files, fix Registry errors, protect your privacy by cleaning out Internet traces, and so on. Advanced System Optimizer scans your system for problems, but if you want to fix them, you'll first have to pay.